Of course I was going to be heading to Boat Noodle Alley near the Victory Monument to sample as many bowls of Boat Noodles (Kuay Tiau Rua) as possible. We had spent the morning at Chatuchuk and were desperately in need of a seat, preferably in air conditioning. We quickly negotiated a tuk tuk to take us to Victory Monument so I could get a fix of the most popular Boat Noodles in Bangkok. 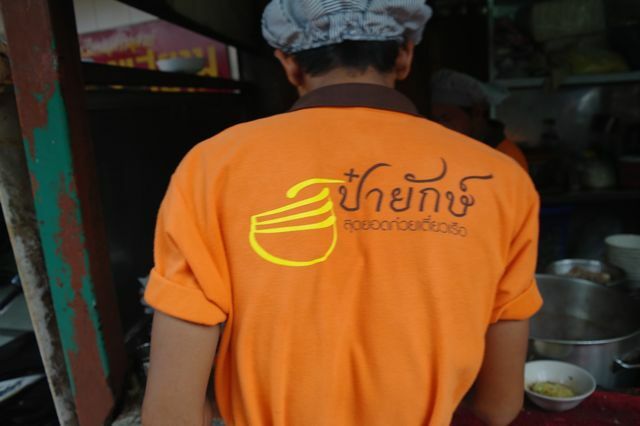 At 9 baht (30 cents) a bowl I reckon they are probably the cheapest too. The alley is actually about four different restaurants that all sell Boat Noodles but we went back to the same one we had visited previously as they have a small air conditioned room that is an oasis in the heat of Bangkok. This isn't really a tourist area so the staff don't speak much English which makes ordering a bit of a challenge. I took the opportunity to test out my rudimentary Thai and managed to get us our first two bowls of beef boat noodles, one with sen mee and the other with sen lek noodles. 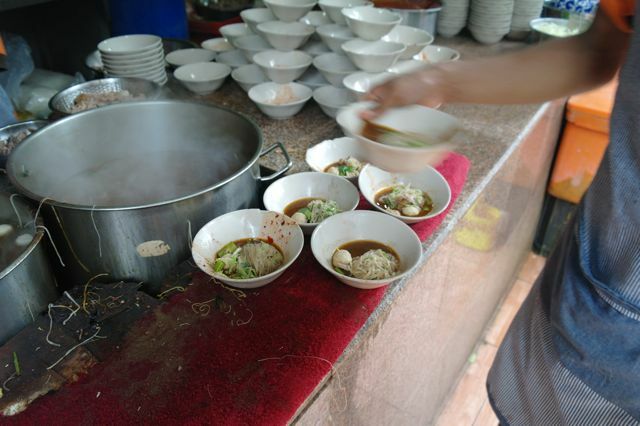 The bowls are really quite small however the soup is very rich and hearty and incredibly flavoursome. The broth is thickened with blood which gives its a beautiful red colour. I realise this might not sound delicious to some but the noodles taste fantastic so I'm totally fine with it. 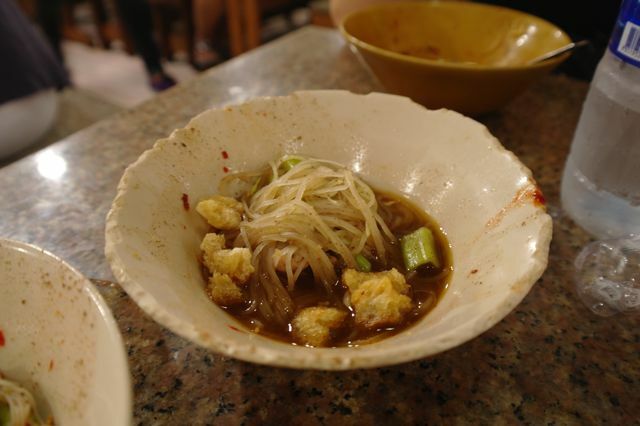 For about 10 baht you also get a bowl of crispy pork skin which is basically like roast pork crackling and this is added to the bowl to give the dish some extra texture. 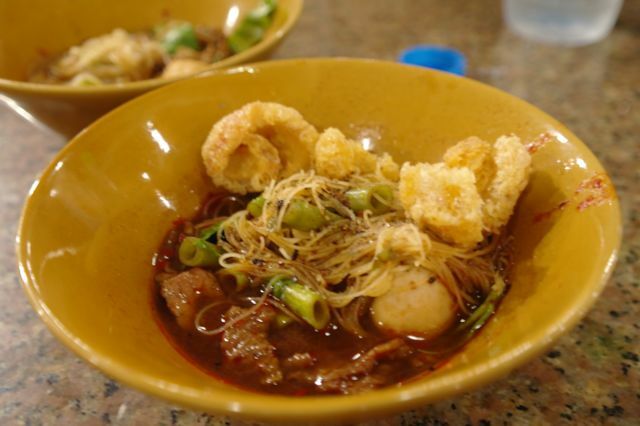 We quickly polished off our first bowls and moved on to a bowl of the pork broth, again with sen mee and sen lek noodles. 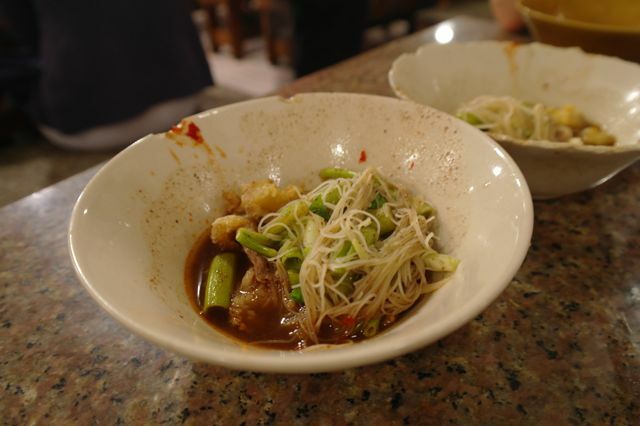 Sen mee are the thin rice noodles pictured with the beef noodles in the first picture and sen lek are slightly thicker rice noodles pictured with the pork noodles above. Obviously not a lot of care is taken with the crockery as this bowl was really worse for wear. Judging by the number of bowls we saw served in the short time we where there I reckon they must sell thousands of bowls a day so its no surprise the bowls are are so battle worn. This is the sen mee version of the pork noodles. I really couldn't say which was better between the beef and the pork as both were absolutely awesome. The green vegetable is Pak Boong (Morning Glory) which is very widely used here and really works well with the noodle soups as it retains its crispness in the soup broth. 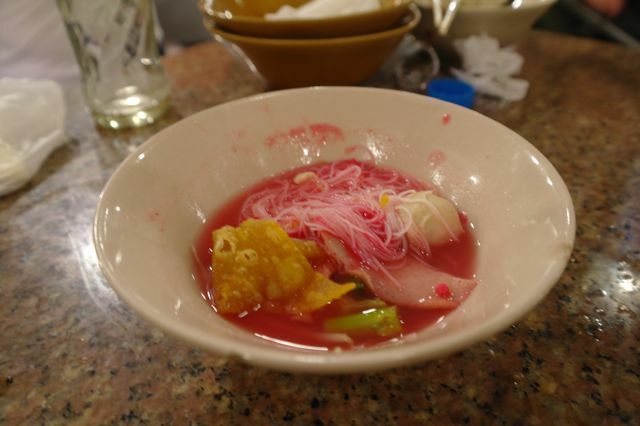 Now I really don't have much of an idea how many variations of noodles they sell at this place, I originally thought it was just pork and beef so I tried to order another bowl of the beef noodles and got this unusual pink soup instead. Maybe they somehow knew that this foreigner wanted to try all of their range and just brought this to me in spite of what I had ordered or more likely my Thai is pretty dodgy and this is what I ordered. I was actually happy to get a chance to try another of their offerings although this fishy number wasn't my favourite. I am assuming by its bright pink colour that it is some kind of Yen Ta Fo. It was ok but really a bit fishy for my liking. 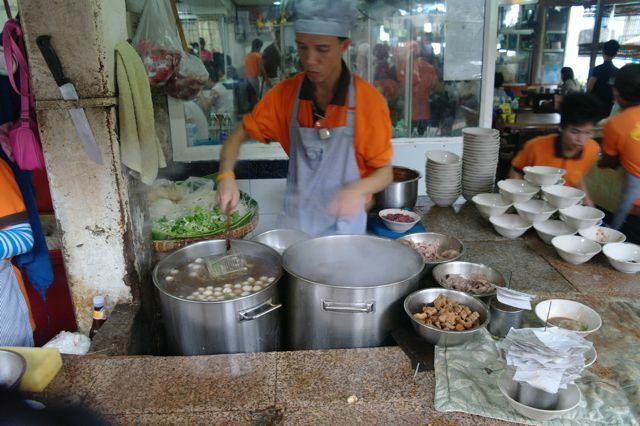 Like most Thai street food one of the best parts is that you often get to watch the food being prepared. 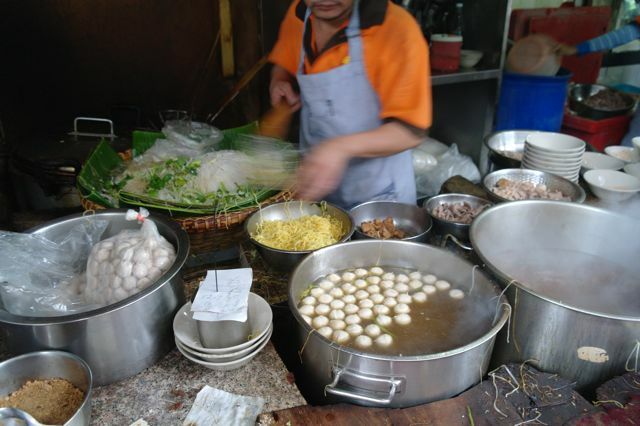 If you ever get to Boat Noodle alley you really have to take a few minutes and watch these guys in action. They move so fast and prepare a bowl of soup in less that 5 seconds. Like the photos show, these guys hands are literally like a crazy blur as they instinctively move in a repeated rhythm preparing hundreds of bowls in a matter of minutes. Second only to the speed of the cooks the waiters ferry trays of bowls to customers as quickly as they are prepared. The whole operation is so fast and smooth it's a real spectacle. I always pass by this place and now I will go in and try it. The waiter's shirt says "Pa Yak" which roughly translates to father giant.. if I'm not mistaken!